IWTC Instructor Molds, Mentors Information Warfare Warriors - USA Patriotism! Intelligence Specialist (IS) 1st Class Richard Ayala, a native of Stafford, Virginia, currently serves as an instructor at Information Warfare Training Command (IWTC) Virginia Beach. 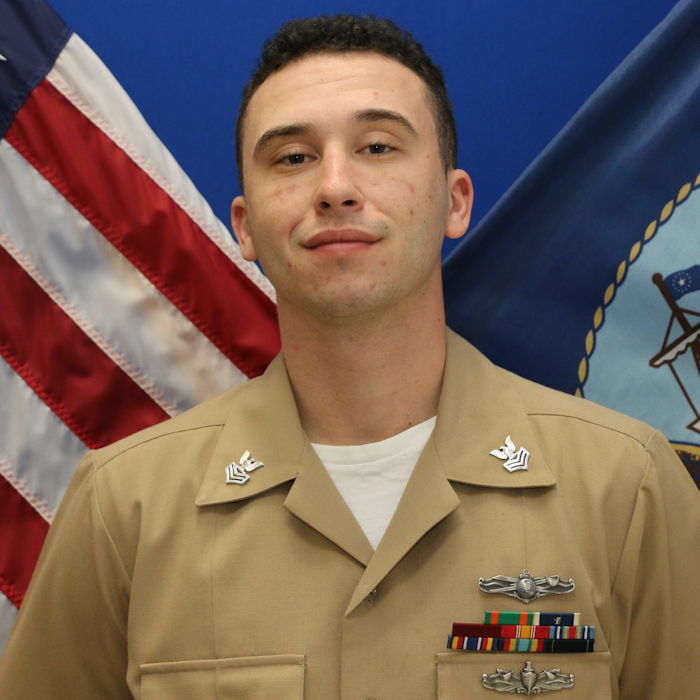 Dec. 20, 2018) Intelligence Specialist (IS) 1st Class Richard Ayala, a native of Stafford, Virginia, currently serves as an instructor at Information Warfare Training Command (IWTC) Virginia Beach. In August 2018, he transferred to IWTC Virginia Beach, where he has led 80 hours of instruction for 106 Sailors during two intelligence training team scenarios. He enlisted in the Navy in December 2013, and after completing basic training at Recruit Training Command Great Lakes, he reported to IWTC Virginia Beach for IS “A” school. Following graduation, he reported to his first duty station aboard USS Gerald R. Ford (CVN 78), homeported in Newport News, Virginia. In July 2014, Ayala volunteered for temporary duty aboard USS Theodore Roosevelt (CVN 71). While there, he qualified and became the only petty officer third class to sit as the fleet intelligence watch assistant, obtained three warfare devices, and was selected as Rough Rider of the Quarter. Following his tour aboard Roosevelt, he returned to Ford, where he led 20 Sailors responsible for collection and reporting during 52 training and real-world events to include satisfying six Commander Task Force 80’s intelligence requirements, and producing the Ford’s first Intelligence Information Report. As a command financial specialist, he conducted 75 financial planning worksheets, and gave 22 hours of blended retirement system training to 600 Sailors aboard. Ayala’s departmental mentorship program was also utilized as the foundation for the command’s mentorship, directly impacting 2,600 Sailors. His efforts led to him being selected as the Ford’s assistant mentorship coordinator. During his time aboard, he was also selected as the Junior Sailor of the Quarter twice, and intelligence department’s Junior Sailor of the Quarter four times. In August 2018, he transferred to IWTC Virginia Beach, where he has led 80 hours of instruction for 106 Sailors during two intelligence training team scenarios. In November, he was elected by his peers as the Petty Officer Association’s “Esprit de Corps” officer, and has also become a vital member in the command’s Morale, Welfare, and Recreation committee. "In my opinion, the United States Navy is an unparalleled service that is composed of men and women who emulate the true meaning of 'Honor, Courage, Commitment' regardless of their personal backgrounds,” shared Ayala. “Whether at sea or on shore, every single day these Sailors are provided the tools necessary to prosper into tomorrow's leaders, both in the Navy and within American society." IWTC Virginia Beach currently offers 65 courses of instruction in information technology, cryptology, and intelligence with an instructor and support staff of 280 military, civilian, and contract members who train over 6,500 students every year at five training sites in the Hampton Roads area. It is one of four school houses for Center for Information Warfare Training and also oversees learning sites at Jacksonville and Mayport, Florida; Kings Bay, Georgia; and Groton, Connecticut to continue aligning IW community training.